Bangladesh and Myanmar finally signed a deal on the refugee issue on Thursday without a deadline on repatriation but with much expectation that the Rohingya will start returning to Myanmar in the next two months. 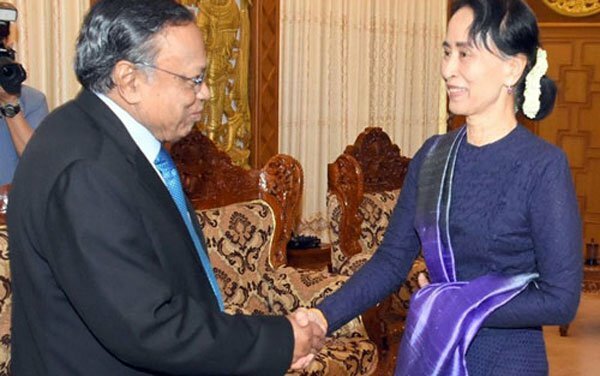 The two neighbouring nations struck the deal following a meeting between Foreign Minister AH Mahmood Ali and Myanmar’s State Counsellor Aung San Suu Kyi in the morning at Suu Kyi’s office. Foreign Minister AH Mahmood Ali and Myanmar’s Minister for State Counsellor’s office Kyaw Tint Swe signed the instrument. They also exchanged ratification of boundary agreement 1998. Minister Mahmood Ali disclosed signing the ‘Arrangement on Return of Displaced Persons from Rakhine State’ after they reached a consensus on the Rohingya repatriation. Ali’s meeting with Suu Kyi began at 10:00 am (Myanmar time), and it lasted for 45 minutes. More than 622,000 Rohingyas have crossed the border and taken shelter in Cox’s Bazar district since August 25 amid allegations of persecution by Myanmar military in Rakhine State. Referring to the influx of Rohingyas to Bangladesh, Prime Minister Sheikh Hasina said during an event on the outskirts of Dhaka on Thursday that these Myanmar nationals are a burden on Bangladesh and urged Myanmar to start taking them soon. Bangladesh also sought the involvement of the international community, including the UN agencies in the verification process. Myanmar did not meet Bangladesh’s full expectation on the repatriation timeframe as it only agrees on a starting time but not on a deadline to complete the process; a senior Bangladesh diplomat told media persons. Another diplomat said Myanmar wants to start the repatriation within the next two months after the deal. He said Bangladesh wants to end the Rohingya repatriation within one year though Myanmar keeps that an open-ended issue without giving any specific timeframe for completion. On the involvement of UN agencies in repatriation Myanmar seemed to soften its position without committing itself to a legally-binding one, an official told Mizzima. Bangladesh and Myanmar, however, agreed on the formation of the joint working group at a foreign-secretary level to start the repatriation process of all Rohingyas.